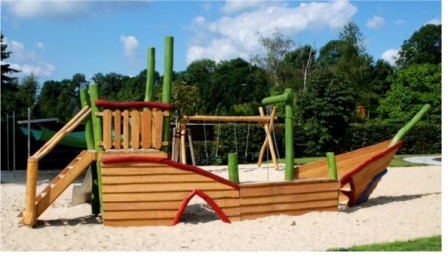 Expansive ship play unit which includes stair access to platform of ship’s bridge including steering wheel for imaginative play. Children can exit the bridge via stainless steel slide rather than walking the plank! Middle of the ship includes mast post which houses rubber sand crane on stainless steel chains as well as a crawl hole out of the ship. Front of the ship includes bench for resting pirates.